This renovated two bedroom home, is only a short stroll or a quick drive to Charlottesville's historic Downtown Mall. Bright and sunny light fills the space making you feel instantly welcomed. This one-level layout is very well appointed and offers great seating areas both indoors and out. The master bedroom has a large king bed with a full en suite bathroom. The white tile and soaking tub give this bathroom a luxurious feel. The second bedroom has a comfy, full sized, tempur-pedic bed. The second bathroom is located just outside the door in the adjacent hallway and features a tiled steam shower. Feel like cooking in? This kitchen is well equipped with new appliances and a great gas range. Want to eat al fresco? Walk outside to the two level terraced decks where you will find a dining table and ample seating. When on the deck you can look around and see the beauty this neighborhood has to offer. Walk down through the rod iron gate and take a stroll through the private neighborhood garden. Feel like reading a book or enjoying your favorite glass of wine? The sunroom is the the perfect, quaint location. If you are looking for dining, music, and shopping options, this house is in a wonderful location and close to all. Note that although guests are not permitted to bring their dogs to this property, we want guests to be aware that the owner does have a dog, in case any of our guests may have allergies. Loved, loved the house. We were very comfortable with our stay there. We enjoyed the deck and the beautiful scenery in the back. We think there about 4 calm deer living around the house next door, so, that was a treat to see that in the middle of the city. Also, loved the morning sun streaming through the windows and the beautiful, unique decor! House is located in a very nice part of town. The property was both elegant and restful, filled with art and artifacts that were healing and uplifting. From the moment you enter the front door, you see a replica of Nike, "Winged Victory" from the Louvre. The "chef's kitchen" not only had all the appliances we could possibly use, there were "kindness" messages and a beautiful canvas of Themis, the goddess of justice. Healing crystals, Quan Yin sculptures, and soft textures all welcomed us into the property. It is, in short, unlike any other rental property you will find...filled with care and an extraordinary vision for well-being. It was a privilege being there. The only minor concern was the sharp turn in and out of the driveway. First time visitors might run over those curbs....but all in all, it is a wonderful place to stay. Sarah Beasley was a phenomenal asset to our wedding. She helped me out tremendously with a "meet and greet" event on the day prior to the wedding. Sarah worked tirelessly, and was a great communicator....sending me e-mails with updates, clarifications, ideas, bullet points, etc. I could not have pulled this event off without the help of Sarah. She was always so pleasant and kind....the perfect person I needed to have around so that I could not worry about the details. One of the highlights of this home is the outdoor area. The back deck is accessible through the living room and side room's sliding doors, and there is a sliding screen to put in place to avoid an irritant fly from coming into the house. On the back deck are several chairs and a large table to dine, as well as a shaded area for resting on a serene hammock. How nice it was for me and my family to wake up in the morning and enjoy a cup a coffee outside while gazing at the beautiful yard, flowers, and full trees, as well as sitting out there in the evening with a glass of wine and actually talking and conversing with each other instead of hearing the noise of the TV. Everyone at Stay Charlottesville is very helpful and friendly. 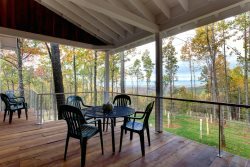 The house is well decorated with a lovely back porch and view. The addition of the ice maker was a welcome addition. Hilary is the best! I have really enjoyed working with her during the past year. This was our second stay at the Nest on Locust. Beautiful and functional home; beautiful yard. We loved the back deck. There aren't enough superlatives to adequately convey the joy of our experience and the quality of the property! The beauty and Zen atmosphere of the home/garden made it the perfect spot for relaxation. We very much appreciated the attention given to every detail of decor inside and outside the home. If we could have had but one wish, it would have been for a longer stay! No complaints. Very friendly and helpful. House was in a fantastic location. Drive up appeal was great and the back porch really set the house apart. Open concept, plenty of room for our party of 4. A shower in the master bath would have been nice, but the steam shower in the guest bathroom made up for it. Very responsive and attentive to your needs. The house is absolutely beautiful. It is beautifully decorated and the garden and deck areas are gorgeous. It is a very roomy property with 2 large bedrooms and great bathrooms, including a steam shower. We highly recommend this property and would buy it for ourselves if it were for sale! Make sure that you allow extra time to enjoy the deck and garden. Beautiful property! Had a wonderful stay. Great indoor and outdoor space. The Wow factor- the deck and garden(s) were especially nice. Great serenity and eye candy for the weary. Decorated to the nines. Booked at the last minute, with just over a day until arrival on a weekend. Called the emergency line to approve my stay but it went smoothly from that point. Enjoyed the evenings on the back deck. Beautiful multi-level wood deck with views of a private garden and lovely lighting that can be dimmed hung on the trellis. We didn't do any cooking but I could see dinner being nice out there as well.